Baylis P, Obradovich N, Kryvasheyeu Y, Chen H, Coviello L, et al. (2018) Weather impacts expressed sentiment. PLOS ONE 13(4): e0195750. We conduct the largest-ever investigation into the relationship between meteorological conditions and the sentiment of human expressions. To do this, we employ over three-and-a-half billion social media posts from tens of millions of individuals from both Facebook and Twitter between 2009 and 2016. 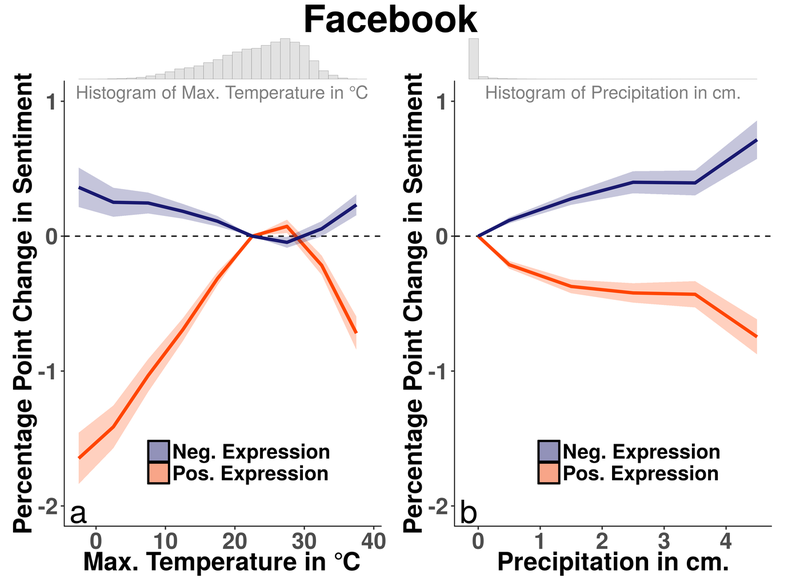 We find that cold temperatures, hot temperatures, precipitation, narrower daily temperature ranges, humidity, and cloud cover are all associated with worsened expressions of sentiment, even when excluding weather-related posts. We compare the magnitude of our estimates with the effect sizes associated with notable historical events occurring within our data.